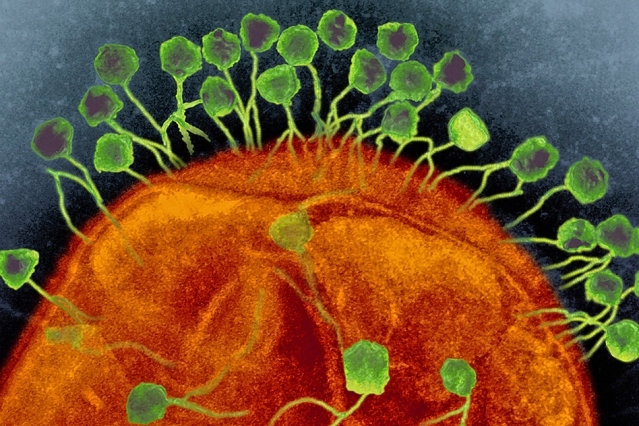 CRISPR systems are found in many different bacterial species, and have evolved to protect host cells against infection by viruses. A team including the scientist who first harnessed the CRISPR-Cas9 system for mammalian genome editing has now identified a different CRISPR system with the potential for even simpler and more precise genome engineering. In a study published today in Cell, Feng Zhang and his colleagues at the Broad Institute of MIT and Harvard and the McGovern Institute for Brain Research at MIT, with co-authors Eugene Koonin at the National Institutes of Health, Aviv Regev of the Broad Institute and the MIT Department of Biology, and John van der Oost at Wageningen University, describe the unexpected biological features of this new system and demonstrate that it can be engineered to edit the genomes of human cells. CRISPR sequences were first described in 1987, and their natural biological function was initially described in 2010 and 2011. The application of the CRISPR-Cas9 system for mammalian genome editing was first reported in 2013, by Zhang and separately by George Church at Harvard University. “We were thrilled to discover completely different CRISPR enzymes that can be harnessed for advancing research and human health,” says Zhang, the W.M. Keck Assistant Professor in Biomedical Engineering in MIT’s Department of Brain and Cognitive Sciences. Second, and perhaps most significantly: Cpf1 cuts DNA in a different manner than Cas9. When the Cas9 complex cuts DNA, it cuts both strands at the same place, leaving “blunt ends” that often undergo mutations as they are rejoined. With the Cpf1 complex the cuts in the two strands are offset, leaving short overhangs on the exposed ends. This is expected to help with precise insertion, allowing researchers to integrate a piece of DNA more efficiently and accurately. Third: Cpf1 cuts far away from the recognition site, meaning that even if the targeted gene becomes mutated at the cut site, it can likely still be recut, allowing multiple opportunities for correct editing to occur. “The unexpected properties of Cpf1 and more precise editing open the door to all sorts of applications, including in cancer research,” says Levi Garraway, an institute member of the Broad Institute, and the inaugural director of the Joint Center for Cancer Precision Medicine at the Dana-Farber Cancer Institute, Brigham and Women’s Hospital, and the Broad Institute. Garraway was not involved in the research. Zhang, along with the Broad Institute and MIT, plan to share the Cpf1 system widely. As with earlier Cas9 tools, these groups will make this technology freely available for academic research via the Zhang lab’s page on the plasmid-sharing website Addgene, through which the Zhang lab has already shared Cas9 reagents more than 23,000 times with researchers worldwide to accelerate research. The Zhang lab also offers free online tools and resources for researchers through its website. The Broad Institute and MIT plan to offer nonexclusive licenses to enable commercial tool and service providers to add this enzyme to their CRISPR pipeline and services, further ensuring availability of this new enzyme to empower research. These groups plan to offer licenses that best support rapid and safe development for appropriate and important therapeutic uses.